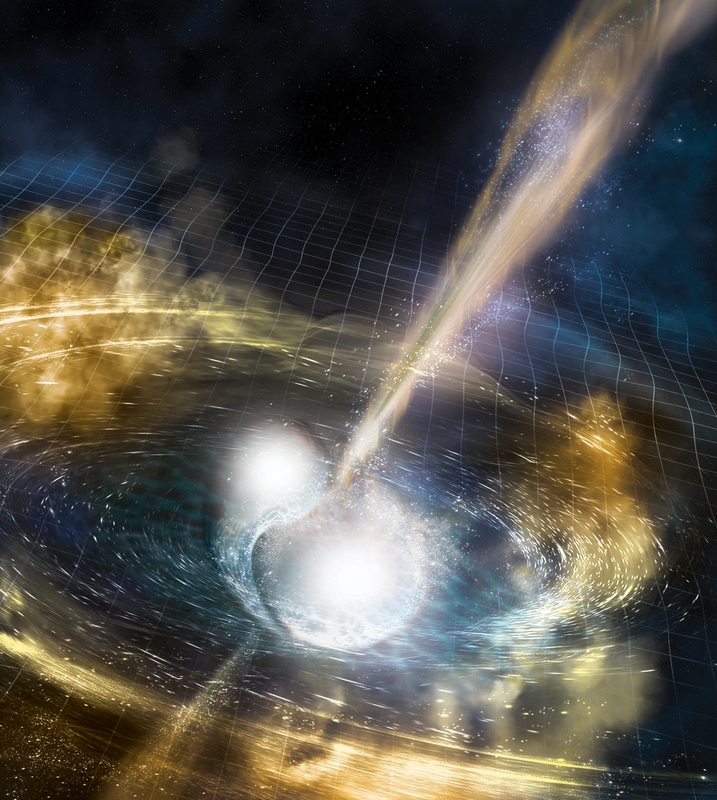 The discovery of a gravitational wave caused by the merger of two neutron stars, reported today by a collaboration of scientists from around the world, opens a new era in astronomy. It marks the first time that scientists have been able to observe a cosmic event with both light waves -- the basis of traditional astronomy -- and gravitational waves, the ripples in space-time predicted a century ago by Albert Einstein’s general theory of relativity. The discovery was made using the U.S.-based Laser Interferometer Gravitational-Wave Observatory (LIGO); the Europe-based Virgo detector; and some 70 ground- and space-based observatories. The first detection of gravitational waves, made in 2015, earned LIGO’s leaders the 2017 Nobel Prize in Physics; in that case, scientists determined the waves were touched off by a collision of black holes, an event that isn’t expected to give off light. 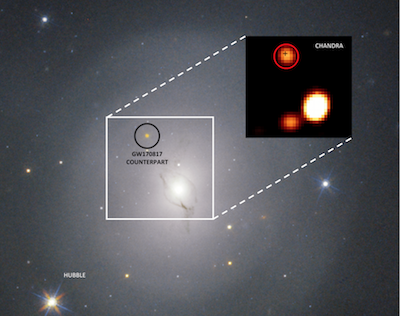 Haggard and McGill postdoctoral researchers Melania Nynka and John J. Ruan are the lead authors of a paper, published in Astrophysical Journal Letters, that details their team’s observations using NASA’s orbiting Chandra X-ray telescope, trained on the point in the sky identified as the origin of the gravitational wave that reached Earth on Aug. 17. Those observations confirmed that the collision of the two neutron stars – among the densest objects in the universe – also touched off a violent jet of hot plasma known as a gamma-ray burst in a galaxy about 138 million light years from Earth. What’s more, the team determined, the burst is the first that astronomers have observed that is “off-axis,” or not pointed toward Earth – providing a perspective that could enable scientists to better understand how these potent bursts impact their surroundings. Neutron stars, formed when massive stars explode in supernovas, are so dense that they weigh two or three times the mass of our sun, even though they’re roughly the size of a city such as Boston or Montreal. A teaspoon of neutron star material has a mass of about a billion tons. Mergers of neutron stars are thought to be responsible for producing most of the heavy elements in the universe, such as gold, platinum and silver. Further study of such collisions could help scientists determine the origin of these elements, which make up almost half of the periodic table. Already, follow-up observations by telescopes around the world have revealed signatures of recently synthesized material, including gold and platinum. The gravitational signal, named GW170817, was first detected on the morning of Aug. 17 by the two identical LIGO detectors, located in Hanford, Washington, and Livingston, Louisiana. The information provided by the third detector, Virgo, situated near Pisa, Italy, helped narrow down the location of the cosmic event. At nearly the same time, NASA’s Fermi space telescope had detected a burst of gamma rays. LIGO-Virgo analysis software put the two signals together and saw it was highly unlikely to be a chance coincidence. Rapid gravitational-wave detection by the LIGO-Virgo team, coupled with Fermi’s gamma-ray detection, enabled the launch of follow-up observations by telescopes around the world, including Chandra. In the weeks and months ahead, telescopes will continue to observe the afterglow of the neutron star merger and gather further evidence about various stages of the merger, its interaction with its surroundings, and the processes that produce the heaviest elements in the universe. LIGO is funded by the National Science Foundation, and operated by Caltech and MIT, which conceived of LIGO and led the Initial and Advanced LIGO projects. Financial support for the Advanced LIGO project was led by the NSF with Germany (Max Planck Society), the U.K. (Science and Technology Facilities Council) and Australia (Australian Research Council) making significant commitments and contributions to the project. 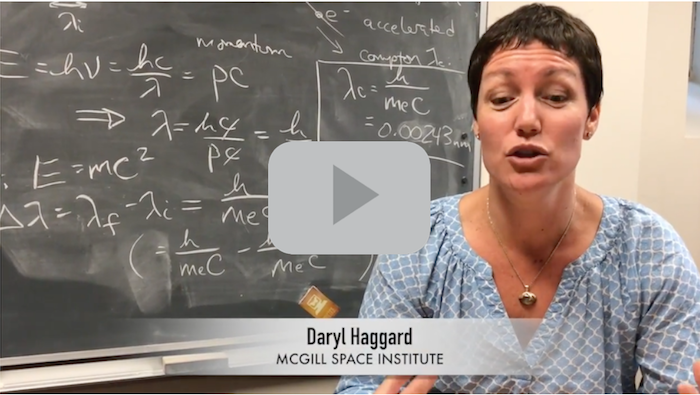 Funding for the McGill-led study was provided in part by the Chandra X-ray Observatory Center, the Natural Sciences and Engineering Research Council of Canada (NSERC), and the Fonds de recherche du Québec–Nature et Technologies (FRQNT). IMAGE 1 CREDIT: NSF LIGO, Sonoma State University, A. Simonnet.